Come tour our fall family room with touches of blue and many cozy neutrals, soft textures, and subtle farmhouse touches. This post contains affiliate links. And…even better…Kirkland’s is giving you an amazing chance to win a $1500 gift card to their store at the end of this post! 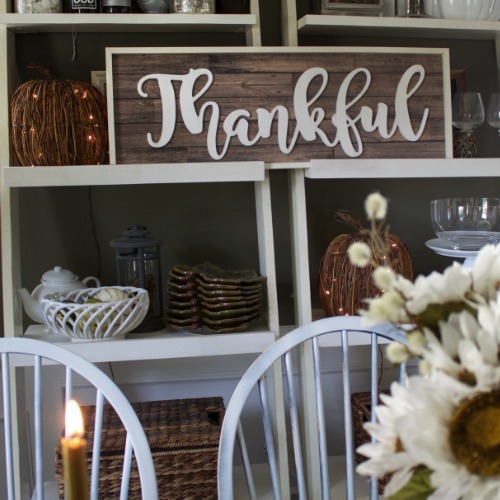 Thank you to Kirkland’s for also providing some of the products for this post. And if you’re stopping by from Tidbits, welcome!! 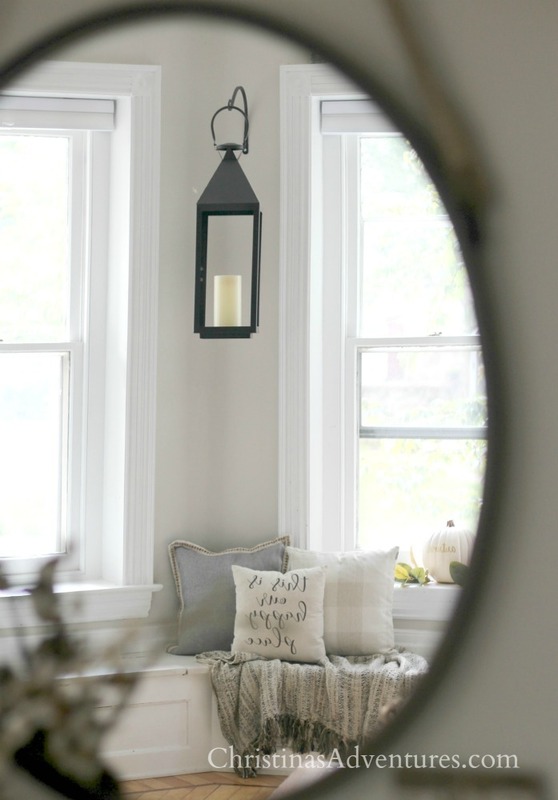 Cami always has the most gorgeous spaces & pictures – I’m always so inspired by her! This year, I just kept things really soft and neutral. We have touches of blue in this room, and I didn’t want to fight against it with our fall decor. I just love the combination of wood tones, blue, and soft neutrals with a touch of greenery. It’s just really subtle “fall”, but the pieces can also be used year-round. LOVE our new magnolia wreath – I also see it really looking beautiful post-Christmas. 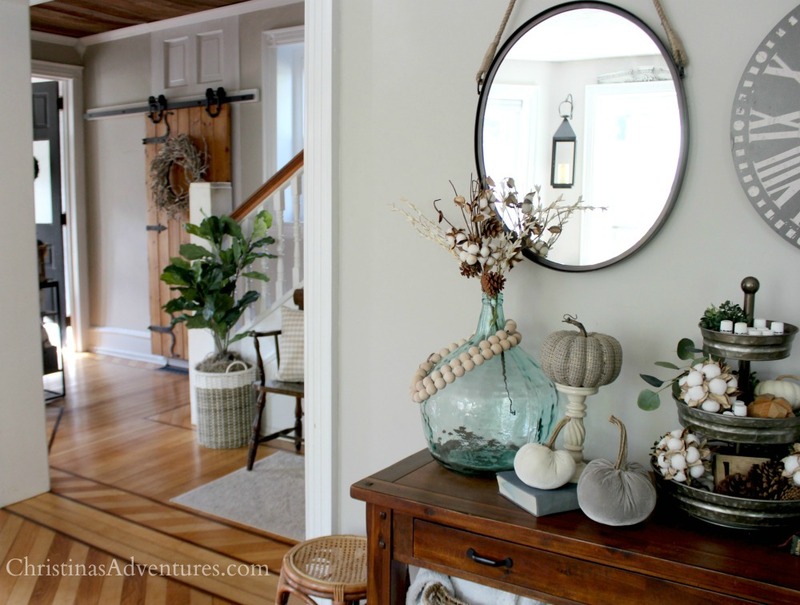 You can get a peek at our entryway in this picture – but come on over to this post and see so much more of this entryway decorated for fall! I’m also kind of loving our new (faux) ficus tree in my vintage crock. Buckley’s not the only one who loves our new throw pillows – they’ll look great year-round! 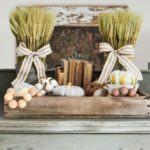 And now you have the chance to win $1500 to Kirklands – how exciting! 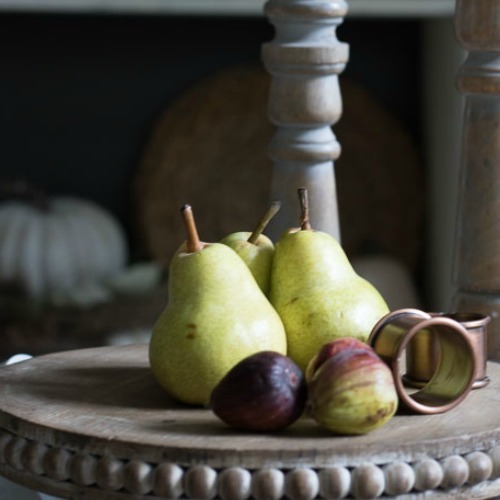 OK next up on your tour… go visit My Life from Home for some beautifully inspiring fall decorating ideas. Beautiful Christina! Love your cozy living room. I love the touches of blue! Your home is so inviting, cozy and warm! Perfect for the fall season! Christina, so nice to meet you and your blog. 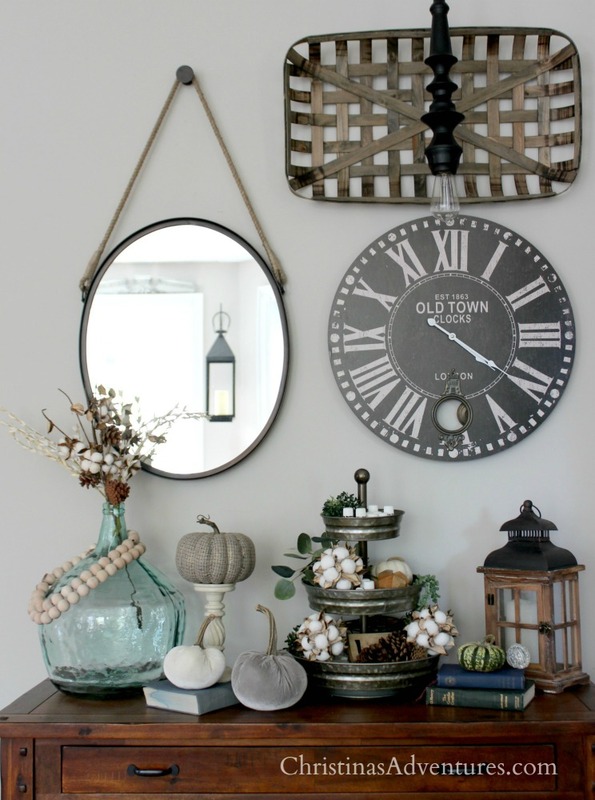 Love the soft blues and your entry table with the clock and cotton balls on the tiered tray. Great spot and great job. Thank you so much, Carol! So sweet of you – I appreciate your kind words! Very cozy! Where is your couch from? I love your beautiful home – and those sweet touches of blue make me love it even more! Christina, I love your home! 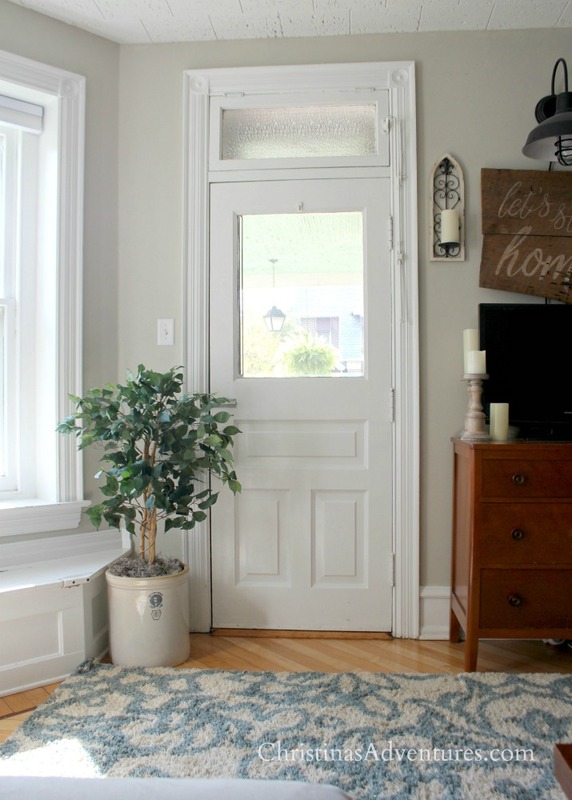 I love the trim around your windows and the door is so pretty. I love houses with lots of windows. You have it decorated beautifully too. 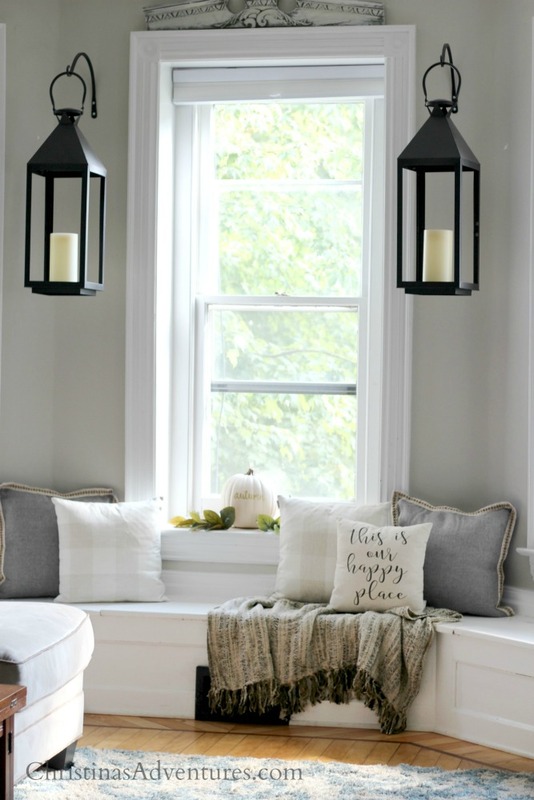 That window seat … LOVE! Your home is beautiful. Love all your blue accents. 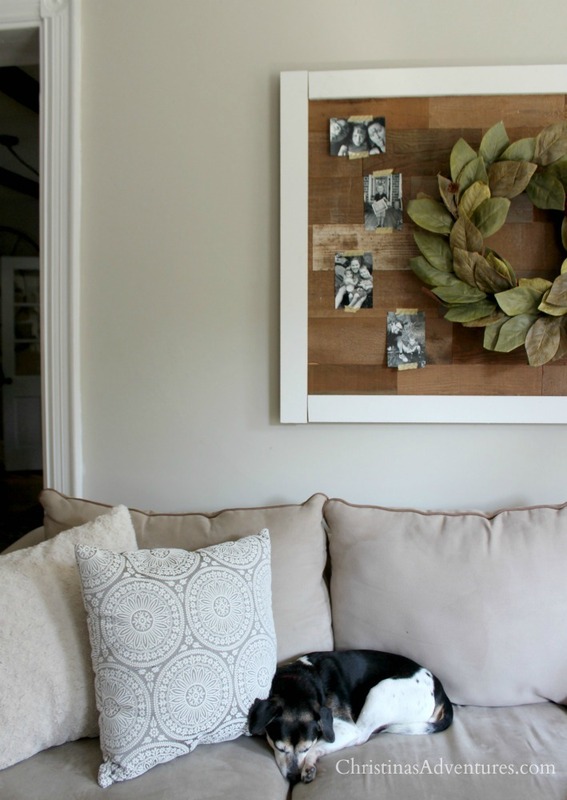 Love the coziness of your home and love the magnolia wreath!!!! This room is just too pretty, Christina! 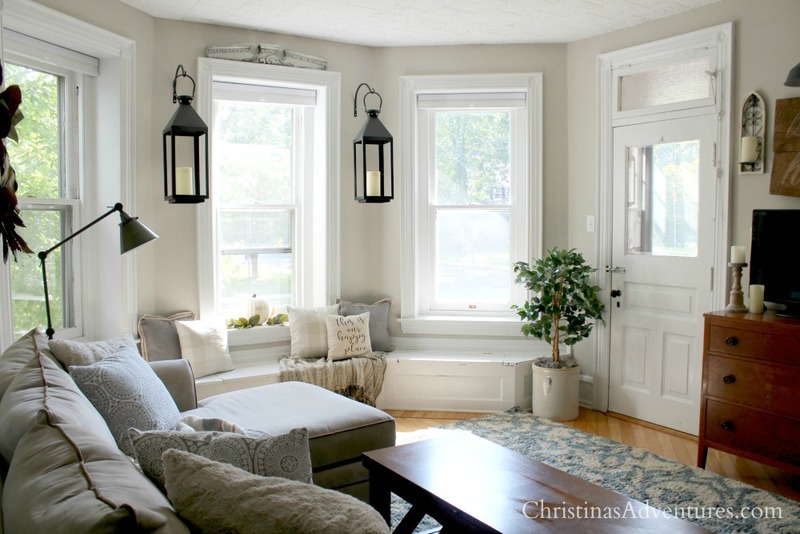 Those lanterns and window seat get me every time! Such a pretty job you did with the tour Christina…hugs! Your home is always so bright and beautiful Christina!!! 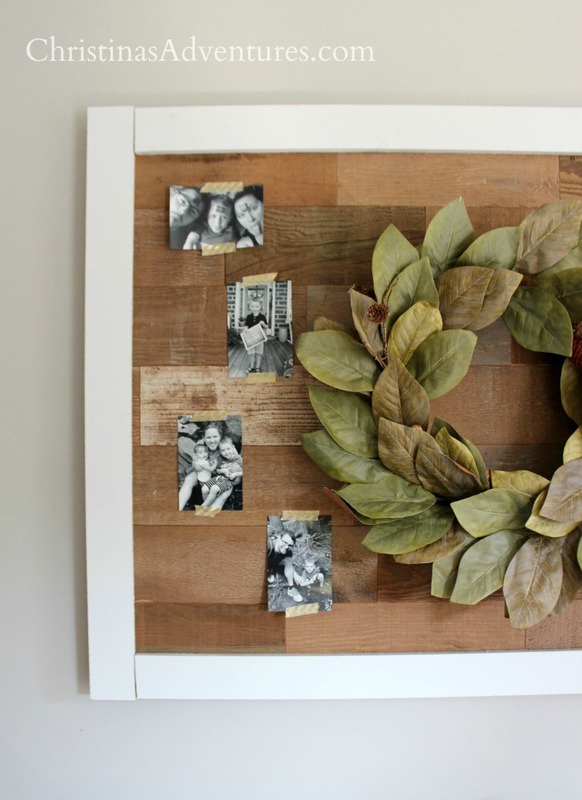 I love the magnolia wreath and all your Kirklands picks! 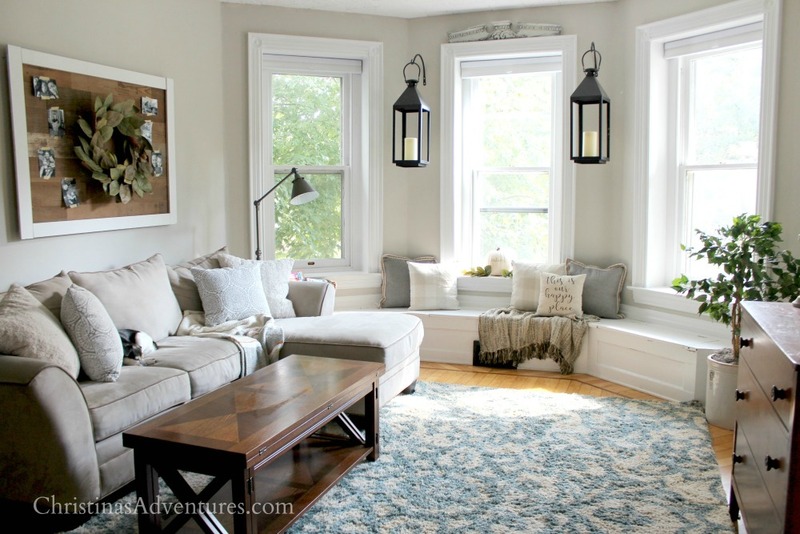 Such a gorgeous home tour!! 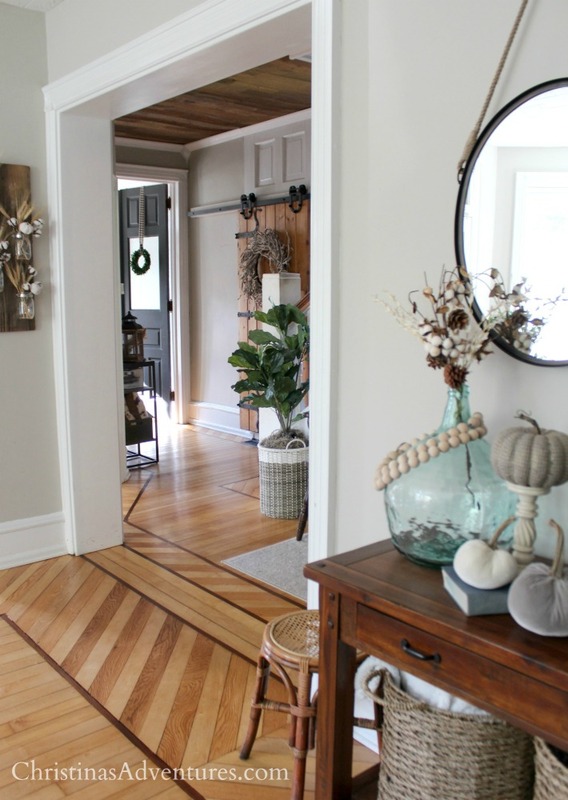 I love the floors in your home and the fact that your decor is so cheery and bright! The lanterns and the magnolia wreath are just gorgeous! 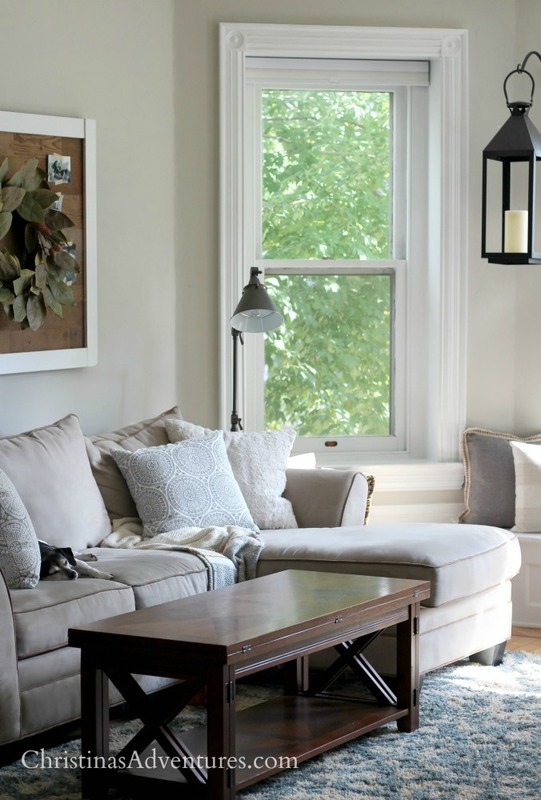 I am obsessed with your living Room and those windows! Your whole home looks so beautiful! 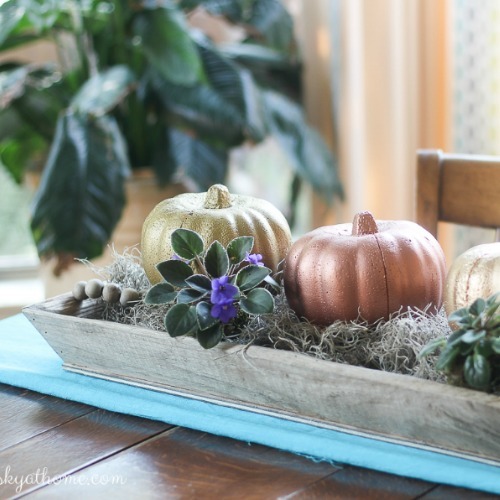 Love the fall touches! 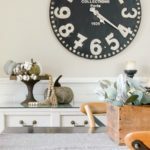 Love the industrial side table on Kirklands.com.